The hubs and I recently found a righteous-looking waffle iron at a charity shop and bought it. The darn thing didn't even look like it had been used. It's a bit bigger than I remember waffle irons being from my childhood. And it's also square in shape instead of round. The irons pop out for easy cleaning as well. I have an old Mirro cookbook from the 30s that has a ton of white flour recipes. As I've had success with Mirro pancakes, I decided to try its 'regulation waffle' recipe. I think the recipe calls for a bit too much raising agent. The waffles were TALL. But all the butter seemed to have done the trick; the waffles did not stick to the irons one iota. When making the waffles a second time, we halved the recipe and only put in a half a tsp. baking powder. In addition, I added orange zest, vanilla & cacao nibs to the mix. The waffles turned out very well. Here's a pic of the monster waffles cooking. 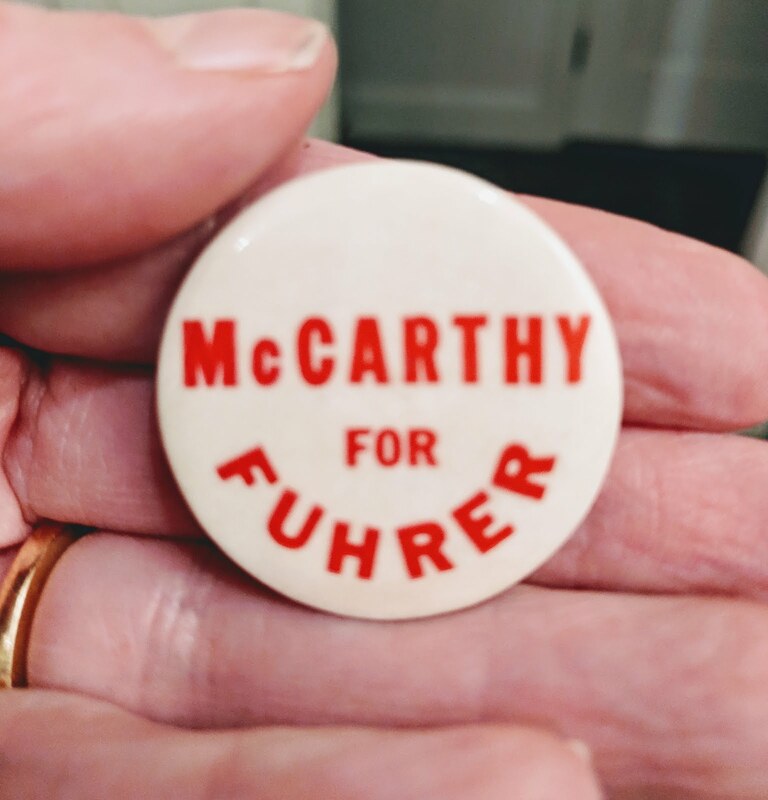 Another charity shop find is this (I assume) anti-Joseph McCarthy button. Let's bring back it back, but with The Donald's surname instead. Heck, I'd wear one. Over here charity shops are known as Op (for opportunity) shops. Over the years we have picked up some gems in them. I have family in California who would definitely wear that badge. With pride. Op shops! I love second-hand item finds so much. The waffle iron is a dream. Yeah, the button idea could catch on. I hope your relatives are as happy as I am that Gavin Newsom is our new governor, btw. I haven't heard any different. And DO hear about things which peeve them. Yes, "Op Shops" here in New Zealand as well. Great bargains to be had. Your waffle iron looks great. How much longer might you have to endure Trump? Trump and all his 'yes men' dopes need to go. I would hope for impeachment & his slinking away in shame, but he doesn't do shame. 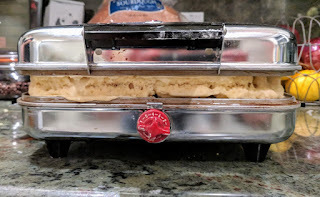 My go to waffle recipe calls for egg whites beat stiff. The no fail "riser". Please god, may trump be so eroded we take him down. Hello Bea! Want to thank you for visiting my blog. I read back a few of your older posts about the trials and tribulations of buying a house in San Francisco. My daughter lives in Alameda and commutes to San Francisco for work. She often talk about the cost of living there. Good luck in finding your new home! And good luck to all of us in surviving Trump. Each day a new atrocity from him. Hi, Sue! -huge fan of Alameda. My aunt lives there. It's such a charming town. House-hunting is a bit ridiculous here; we may throw in the towel at some point, but continue to plug away for the duration. I actually know who would make something like that for you. I'll have to look up a link. Now that you've done waffles, you must make cake waffles. 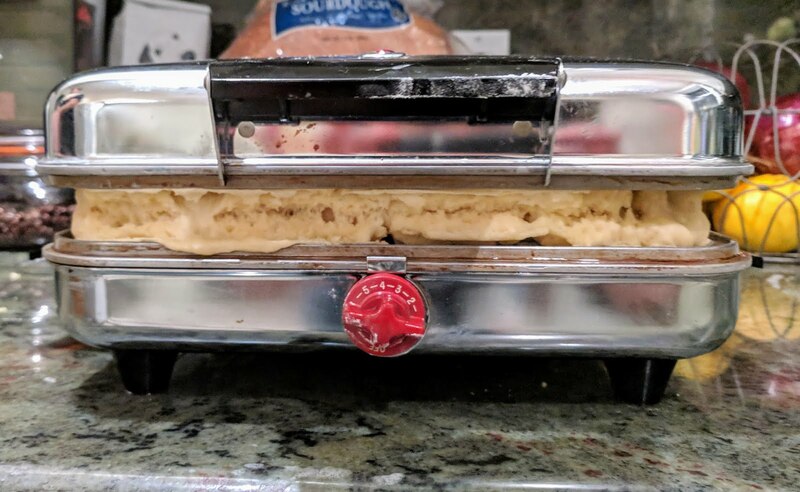 That is, cake batter in the waffle iron. Great dessert. She does ceramics, but I'm sure a ceramic form of that button would be right up her alley. You'd just have to request it. Wow, Liz! Thanks much on both fronts!